Just in case all you thought I have done the last week is fixate on Curly's last school program, rest assured - there has been lots more going on round here. It is going to take multiple posts to share our latest adventure. You won't believe the ending though, so hang in there. One evening last week I was standing at my kitchen sink when an ENORMOUS raccoon crawled out from under the gazebo part of our deck. It was right below the kitchen window. It was still very sunny out. Why wasn’t this guy following his natural nocturnal instincts? Laddie made some noise and it ducked right back under the gazebo. Moments later it reappeared. The next night was a beautiful night. I dropped Curly off at dancing and called Reggie, who was the only one home. Coach was at work. Mini was in DC with her class. Tank was at the high school graduation playing with the band. Eddie, who is a junior, went to the graduation because so many of his friends were graduating. Lad had a late loop and wasn’t home from caddying yet. I asked Reg if he wanted to invite a couple kids over to shoot hoops. He jumped at that offer, but was bummed when no one could come. I asked him if he wanted to go mini-golfing with me instead. There were a dozen things on my never-ending agenda that I could have accomplished that night. My evening was pretty open - the plan was for Coach to drive up to dancing to pick up Curly after work (dancing is closer to work than home, but still in the wrong direction). I feel like Reg slips thru the cracks at times. He isn’t one of the ‘big boys’ and doesn't go to the health club to workout with them. I have noticed that he clams up when he is around high school-ers. I have decided this is because he can't make a move without being knit-picked by his older brothers. He no longer travels with the girls and I to dancing competitions. He has a blast with Curly, but he prefers to have a buddy over 24/7. 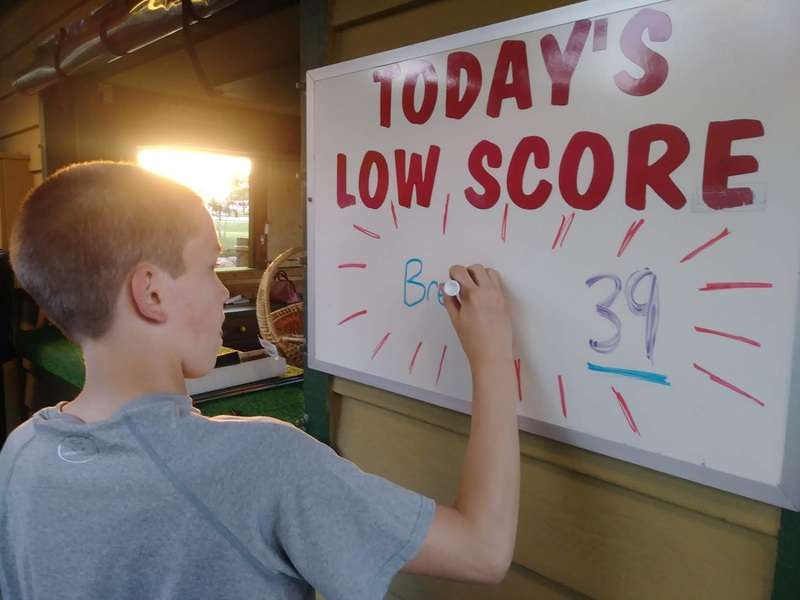 His face lit up when I gave him an opportunity to beat me at mini-golf. It is rare that the kids get one on one time with Coach or I. In true Reg fashion, he got 3 hole-in-ones and easily beat me. I would bet that the highlight was the first hole when I hit my ball too hard. It went into the water and I had to buy another ball for 75 cents. Later, Reg was quick to share this fun fact with his siblings. I am just glad my antics prove so entertaining for my offspring. Reg ended up tying the low score of the day and was allowed to wipe the other low scorer’s name off of the white board and add his own. Reg gets his win or die trying approach to all things from his father's side. I think that wold be a hard way to live, said the mom who hit her ball in the water on hole one. I am glad we went, but Coach ended up texting me that he would prefer that I pick up at dancing. We still had plenty of time to finish our round. I assumed Coach was swamped at work, but later realized his need to race home had more to do with the NBA playoffs. The rat. Honestly, I didn't mind. He works such long hours, I hate to add to his day by demanding that he drive one leg of the dancing driving. As Reg and I approached the house after our put-put round, I noticed a police car in the middle of the street. It looked like the officer was staring at something in our backyard. Our house is on the corner, so you can see into my yard from the street. I pulled into the driveway and held my breath as the police cruiser pulled up at the end of the driveway. ‘Oh no. What did Lad do now?’ I whispered over and over to Reggie as I got out of the car. The officer pointed at my deck, ‘There is a huge raccoon on your deck.’ Ah, relief that the raccoon was the pest and not one of my teenagers. This relief was short lived . . . Sounds like someone has a rabid racoon in their yard! As always, I'm looking forward to the end of this story!!! Beth - hold on to your hat. I promise you this one takes the cake. Not literally. Not to worry, I wasn't feeding a raccoon cake. Heading to my 25th year college reunion tomorrow, but I do have the rest of the posts scheduled to keep you entertained for the whole weekend.